Home » Uncategorized » The Drain to Spain Stays Mainly on the Plane? 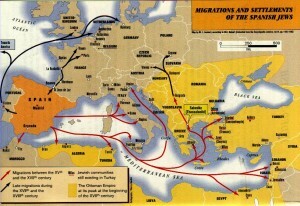 In recent weeks, reports appeared in the mainstream media, including the New York Times, the Financial Times, and the BBC News, as well as in the Jewish media, about a new law put forward in Spain that would allow Sephardic Jews—the descendants of the Jews expelled from Spain in 1492—to obtain Spanish citizenship. 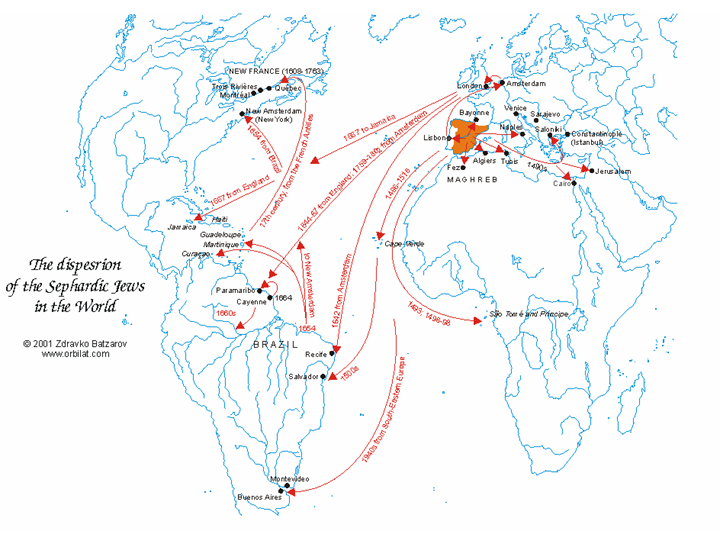 The proposed legislation is generally viewed as “a gesture of conciliation for Spain’s expulsion of Jews during the Inquisition” (in the words of the New York Times), and preliminary indications suggest that some Sephardic Jews may take Spain up on its offer. Yet many questions remain. Is there more to this law than a belated attempt to right a historical wrong? Why is it being considered now? Will the Spanish parliament actually pass the law? And if so, how many people, and who exactly, will be eligible? What repercussions will this legislation have on the demographics and economy of Spain, Israel, and other countries as well? 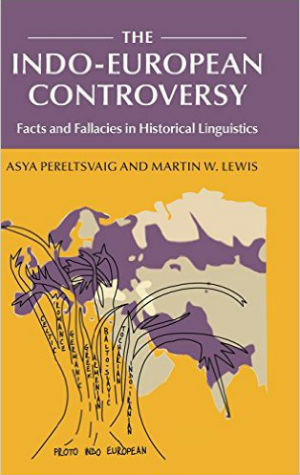 Will it set a precedent for other ethnic groups expelled from their historic homelands, such as the Circassians? This post will consider these issues in some detail, but first, a little history. Returning to the present, the newly proposed Spanish law is viewed by most pundits as a political gesture, an attempt “to right a half-millennium old ‘historic mistake’ against its onetime flourishing Sephardic Jewish community”. It has also been suggested that “Spain made the offer to mollify Israel, after Madrid supported last year’s successful Palestinian bid for a seat at the United Nations”. 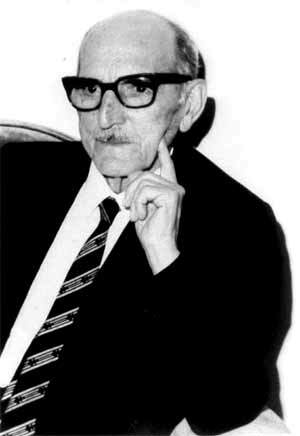 Others, such as Abraham Haim, chairman of the Council of the Sephardic Community in Jerusalem, see this measure as “the latest step in a reconciliation process that began with the establishment of diplomatic ties between Spain and Israel in 1986”. Other milestones in that process include the 2011 statement by the leader of Spain’s Balearic Islands condemning the slaughter of 37 Jews from Mallorca in 1691 during the Spanish Inquisition and King Juan Carlos’ visit to a Madrid synagogue in 1992 to “recognize the injustices of the past”. Yet, there are deeper reasons for this measure. The economic situation in Spain remains volatile: in mid-October 2013, The Economist published a somewhat optimistic article titled “Spain’s economy. The worst may be over”, but just days later The Financial Times was far more skeptical about the country’s economic recovery. Although there are signs that the job market has started to stabilize, Spain’s unemployment rate at 26% remains among the highest in the Western world. Among people under 25, unemployment is 56.1%, higher than in any European country beside Greece. Massive budget cuts and wage freezes for government workers have undermined the country’s social services. Emigration is on the rise. 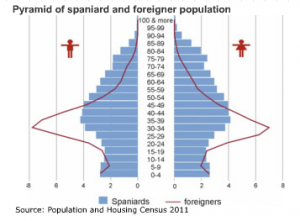 Spain’s population is not only shrinking but also ageing, as life expectancy is on the increase. By 2022, the average life expectancy is expected to reach 87 years for women and 81.8 for men, growing by 2.5 and 1.9 years compared to the present figures. El Pais reports a forecast of “23,428 people aged over 100, more than double the current number”. Immigration too plays a role in the ageing process, as a growing number of younger people are leaving the country. These trends will translate into an increase in the number of elderly dependants, placing an even heavier burden on the country’s welfare system and the economy in general. Spain’s demographic trends are thus worrying not only in their own right, but also because they are bound to have a negative impact on the economy, potentially placing Spain in a self-perpetuating downward spiral. Thus, creating more jobs is an ever more urgent need, “given that this is the main reason immigrants come in the first place, and why people leave to look for work abroad”. In this context, inviting Sephardic Jews may be seen as possible partial remedy for Spain’s demographic and economic ills. The proposed legislation, however, is not a done deal yet. Although approved by the Spanish government in early February 2013, it still has to be passed by the country’s Congress of Deputies. But Spain-internal politics may prevent the new law from being enacted. The legislative proposal was filed in November 2013 by the ruling center-right Popular Party, but Spain is to have general elections sometime in the next two years, and some pundits predict that the current government will fall. It is not clear that the Socialist Party would continue to support the Sephardic citizenship bill. Even if the proposed law passes the parliamentary vote, another complication would be figuring out who would be eligible. Although one would no longer be required to live in Spain (a two-year minimum is the current requirement for naturalization) or to renounce one’s previous citizenship, it would not be easy to claim blood ties to people who died half a millennium ago. In this regard, the draft legislation does not provide clear answers. According to articles in Forward Thinking and the New York Times, the law says that one does not actually need to be Jewish to claim Spanish citizenship, yet other sources say that the law as currently formulated would not apply to the descendants of the “conversos”—the Spanish Jews who underwent forced conversions to Catholicism in order to remain in Spain. Although the promise made at the time was that the “conversos” would be treated as other Catholics, in practice they continued to be persecuted and most of them ultimately left Spain. It is estimated that there are millions of descendents of conversos worldwide. The possibility that descendants of “conversos” might not be eligible for Spanish citizenship raised angry reactions from that community. It is ironic that descendants of the Jews who were forced to convert might be required to convert back to Judaism before they can prove their link to Spain’s pre-expulsion Jewish community. In an interesting twist, Natan Sharansky, chairman of the Jewish Agency for Israel and former Soviet dissident, recently said that “the state of Israel must ease the way for their [the descendants of the “conversos”] return”. The official reaction from Israel has been mostly positive, although some senior rabbis were not pleased: Rabbi Shlomo Aviner of the Religious Zionist rabbinical authority has “forbidden Israelis from obtaining the passports on the grounds that the gesture may be a political ruse to ‘make up for’ the expulsion of Jews” and Sephardic Rabbi Eliyahu Abergil, a judge at the Jerusalem Rabbinical Court, reminded everyone that there is an old rabbinical prohibition against returning to Spain. It is possible, however, that the Spanish offer would prove attractive to Sephardic Jews from Turkey, where the per capita GDP is about half of that in Spain, and the government’s continuing push for the application of Islamic law may make Jews feel unwelcome. 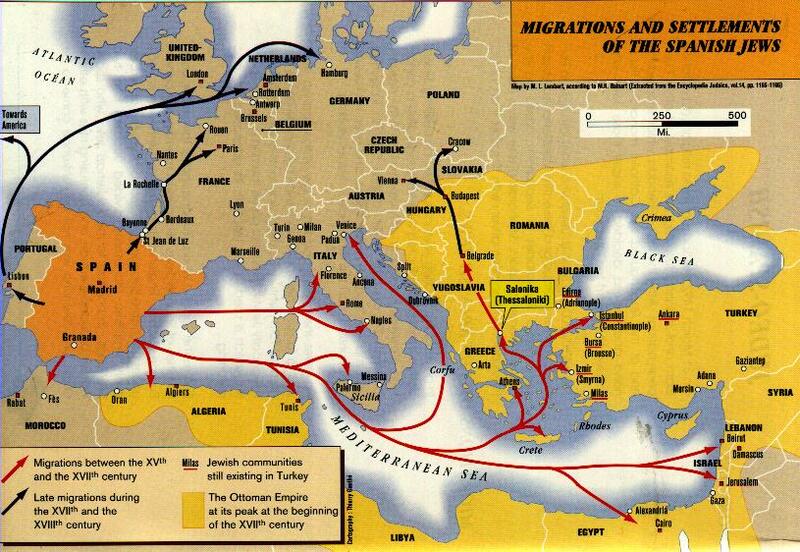 Currently, the number of Sephardic Jews in Turkey is estimated between 15,000 and 25,000. 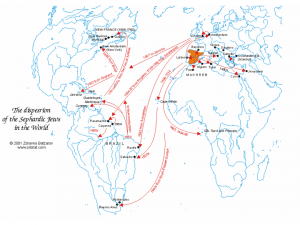 Another country that may become a source of Sephardic migrants to Spain is France, which is today boasts the world’s third largest Jewish community, numbering about 480,000-500,000, most of whom are Sephardic. 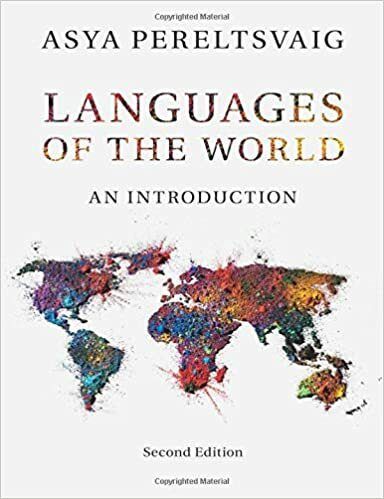 France’s Sephardic community can be traced back to exiles from Spain in the late 1400s, but most French Jews come from Algeria, Tunisia, and Morocco in the 1950s and 1960s. Recent reports in the Jewish press indicate a sharp rise in “aliya” (immigration to Israel) from France, driven by “a deepening sense of insecurity and a stagnant economy”. While in absolute numbers, “aliya” from France remains but a trickle, a European Union survey of Jews from nine countries released in November 2013 indicates that a large proportion of French Jews are thinking of leaving. France ranked second only to Hungary in the number of Jews contemplating emigration because of anti-Semitism, at a staggering 46 percent. 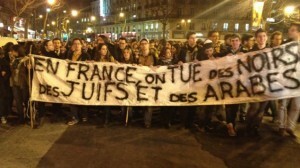 France also was second in the number of Jews who feared self-identifying as such in public (29 percent). The turning point in Jewish attitudes toward France appears to have been what many refer to simply as “Toulouse”, the 2012 slaying of three children and a rabbi by an Islamist at a Jewish school in the southern French city. 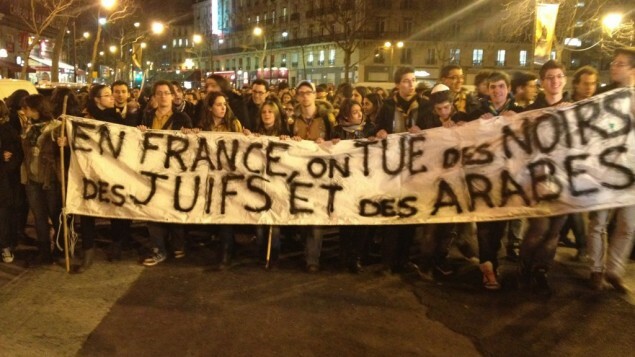 Anti-Semitic attacks in France are on the rise: in 2012, a total of 614 incidents were recorded, a 58 percent increase from 2011 (see the image of protesters raising a banner reading “in France, we kill Blacks, Jews, and Arabs” during a silent demonstration in Paris in March 2012). Some 40 percent of the increase happened within 10 days of the Toulouse atack. Although they already possess the coveted EU passport, many Sephardic Jews from France may decide to move to Spain rather than Israel, especially if Spain maintains its “Jew-friendly” image. In the next post, we will consider more closely the question of who qualifies as a Sephardic Jew, and some of my own family history will be revealed.